As we will need your measurement at time of customising your jeans, you might not have it handy right now, so registering will enable you to save the customisation and use it later when you take measurement on your own. 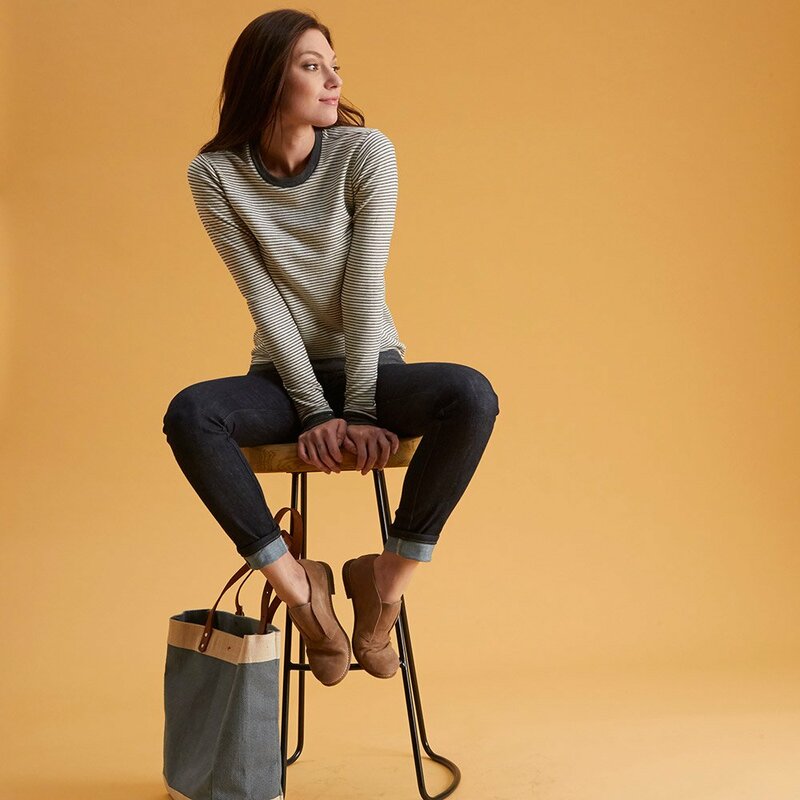 To order Custom Jeans for men with Stoned Grey Matt finish premium denim, Please select below options to Design your own Jeans, Select Fabric, design details & fit preference below step by step and provide your measurement to place an order. Maximum image height: 8000 px. What Price Am I being charged for my Size? 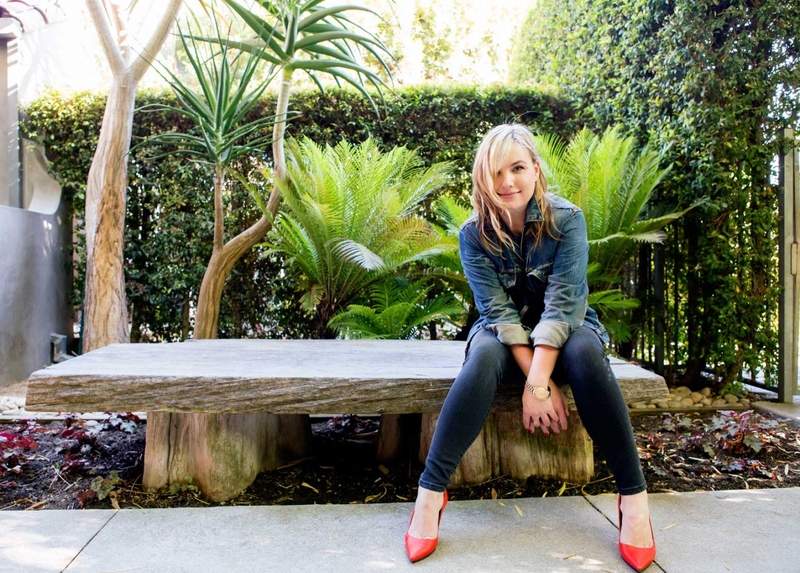 As these are custom tailored made jeans - each jeans is individually crafted and stitched. We need you to provide your measurements - either garment measurement or body measurement depening on your preference and comfort & fit . Please follow our simple guide on how to measure. Measure from the back of your waistband (taken while measuring your waist), down and around, upto the front of your waistband. Please consider the waist rise as provided above, for calculating the crotch. First take the waist line taken for measuring your waist (calculated above) as the base. With the help of a friend measure the side of your leg from the waistline. Keep the tape parallel to your leg and let it flow free to the floor. 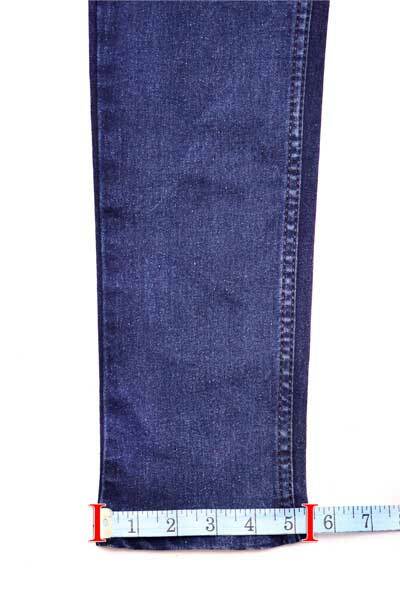 This will be the outer length of your jeans. You can take this measurement either bare footed or wearing your shoes depending on your preference. 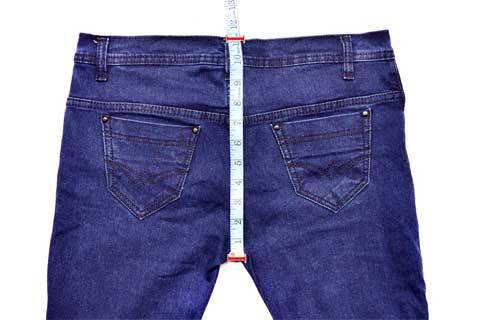 Alternatively we recommend you measure the length of your best fitted jeans and add or reduce depending on your preference. 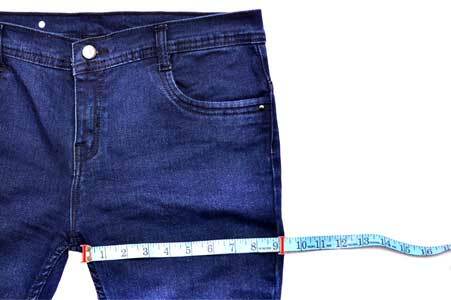 How to measure the length of your jeans - The out seam is the entire length of the jeans...measured from the top of the waist...down the side- all the way down to the leg opening. Stand in front of the mirror with your heels together. 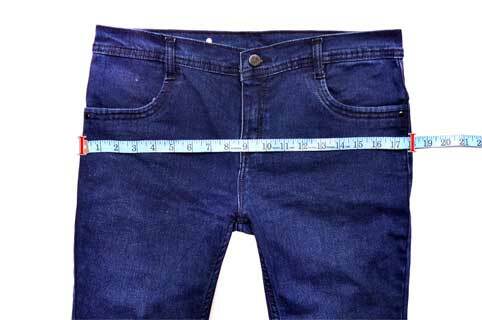 Measure around the fullest part of your hips by positioning the tape measure close to the body without tightening. Measure circumference of your thigh line at the widest point of the thigh just below the buttocks. Measure the circumference of your knee line at the widest point of the knee by placing the tape measure close to the body without tightening. Measure circumference of your calf line at the widest point of the calf by placing the tape measure close to the body without tightening. 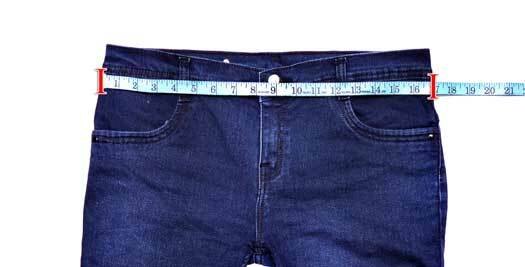 Find the waist measurement by stretching the measuring tape horizontally across the waistband while the jeans are laying flat. Multiply the number by two to determine the full waist circumference. The out seam is the entire length of the jeans...measured from the top of the waist...down the side- all the way down to the leg opening. 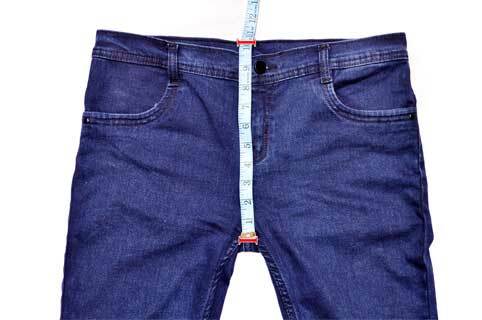 The most accurate way to measure the hips is to lay it flat across the base of the zipper. Then measure from edge to edge the entire length and then double this for complete measurement. Place the jeans flat on the surface exactly as shown in the image and then measure from point A to B and then multiply by 2. This will be your thigh measurement. 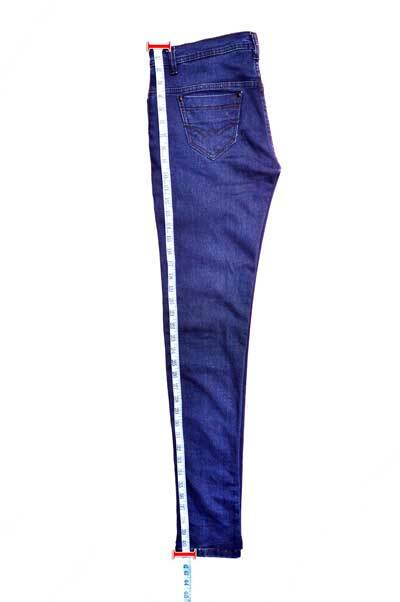 Measure 13 inches from the crotch down the inside seam of the leg. From this point (13 inches down from the crotch) measure from one side of the pant leg to the other (the width of the knee). Double this measurement. The back rise is from the crotch seam to the top of waistband in the back. Why do we require your photo? 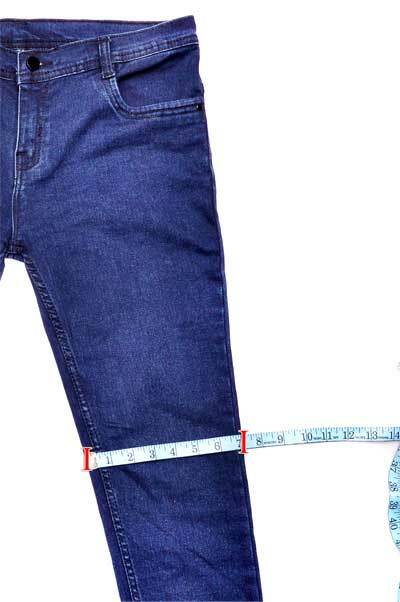 Some time it happens to be easier to understand your body physics and your given measurement, As we know you are Unique and your jeans shall be so, by providing your photo, you will help us to provide you 100% perfect jeans as you desired. Though its Optional, and also we respect your privacy, and your given photograph will be used only and only for understanding your body measurement. I had doubt initially when I placed an order with this guys, but to my surprise the jeans I received exceeded my expectations by miles, fabric is no doubt Genuinely Good Quality and Smooth even for rigid 100% cotton denim, then I placed reorder for 2 more jeans in different style and fabrics, and Once again they made it as I wanted to have, they certainly have quality and experts, my winter is going to awesome with these pairs of jeans.